This is one of the prototypes I’m working on, I drafted the pattern from scratch myself – a big accomplishment for me! 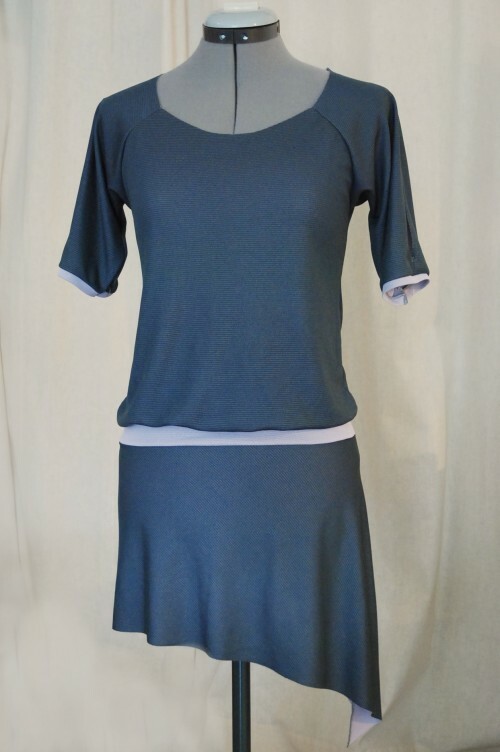 It’s a raglan dress using purple/lavender wick-away material. This material drapes beautifully and is a functional high-performance fabric. The resulting dress is slinky and feminine but with a modern, techy edge. The drop waist and blousy top section are figure flattering and comfortable, and the keyhole sleeves are both a fun design detail and a functional way to work in more ventilation. It’s almost impossible to wrinkle this fabric, so you could definitely go for a brisk walk on your lunch break in this dress, combined with leggings and flats. Since it’s a prototype some of the edges aren’t finished. It looks a little flat here, but it really comes alive on a real person. I am going to finalize the pattern and look for fabric with similar qualities to make the final dresses in. love it! I told your Dad, I never designed a dress from scratch, but I can tell by looking at it on the dummy that you are completely wired into dress design. I showed him how you cut the skirt on the bias but left the top on the straight grain–an important way to control the drape of the dress as a whole. This dress is incredibly flattering and a wonderful use of a really great looking fabric. I can’t wait to see the final draft! hi mom! thanks so much! i knew you would notice the bias cut on the skirt :) still looking for the right fabric to purchase in a large quantity for making more of these, we’ll see what i can find! …it’s not just your mom who thinks you are completely wired into dress design. i love this dress. and i think it so cool that you are using “tech” fabric.